Real Time PCR Quantification and Differentiation of both Challenge and Vaccinal Mycoplasma gallisepticums trains Used in Vaccine Quality Control. Sayed RH, Ahmed HA, Shasha FA and Ali AM. Mycoplasma gallisepticum is an economically important pathogen of poultry worldwide, causing chronic respiratory disease in chickens and turkeys. Vaccination of poultry with Mycoplasma gallisepticum live vaccines is an approach to reduce susceptibility to infection and to prevent economic losses. The goal of this study was to develop an alternative method for evaluation of live and killed vaccine using quantitative differential real time PCR (rt-PCR) assay. Real time PCR assay was implemented for titration and identification of three types of Mycoplasma gallisepticum (F, ts-11 and field strain). Three groups of chicks were vaccinated by using F- strain, ts-11 and killed vaccine and the forth group was considered control. Challenge test was appliedby using Mycoplasma gallisepticum field strain (108 CFU) at three weeks post vaccination. Antibody ELISA titers against Mycoplasma gallisepticum were 319, 259 and 1009 for F, t-11 and killed vaccine respectively at 3 weeks post vaccination. The protection rates were 81.5%, 74%, and 66.6% for F- strain, ts-11 and killed vaccine respectively that was determined by air sac lesion scour. Using quantitative differential rt-PCR for necropsied birds at 5 days post challenge 7days post challenge and 14 days post challenge demonstrated that the F-strain vaccine had ability to prevent shedding of field strain at 14 days post challenge mean while the ts-11 and killed vaccine decreased shedding of field strain from 108.1 and 108.6 to 105.1 and 105.8 CFU respectively at 14 days post challenge. In this study, rt-PCR had ability to identify and quantify of two types of vaccines (F and ts-11) and field strain. 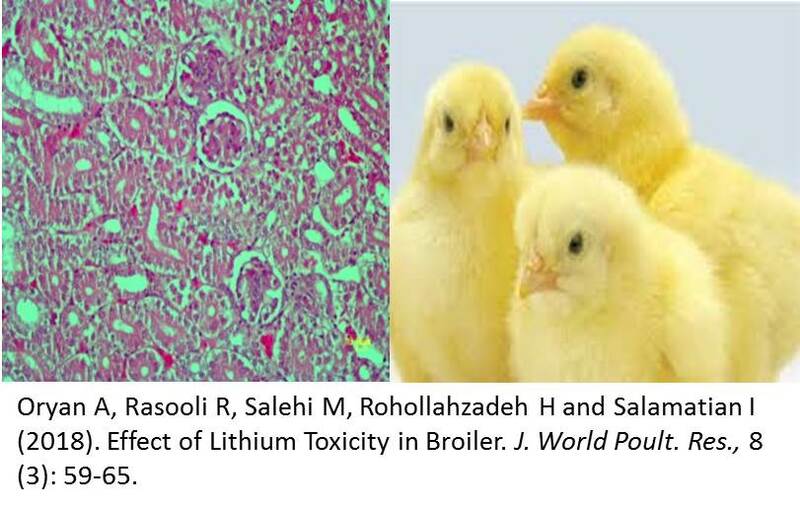 Effect of Lithium Toxicity in Broiler. Oryan A, Rasooli R, Salehi M, Rohollahzadeh H and Salamatian I. 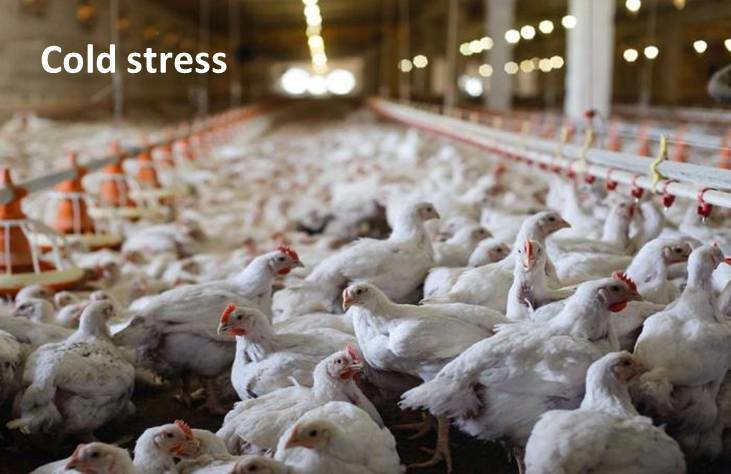 Effect of Cold Stress and Various Suitable Remedies on Performance of Broiler Chicken. Qureshi S, Musadiq Khan H, Saleem Mir M, Ahmad Raja T, Alam Khan A, Ali H and Adil Sh. A biological trial was conducted on commercial chicks during the winter months (December and January). Day old commercial meat type broiler chicks (273) were procured from a reputed source. Cold conditioning (20C to 80C) at third and fourth day of age for 3-4 hours was provided to 78 birds. These early cold conditioned birds were kept separate until distributed into respective treatment groups (fifth and sixth). At the end of second week, the chicks were individually weighed, distributed into 7 treatment groups of 3 replicates with 13 chicks in each replicate. Cold challenge @ 20C to 80C for 8 hours was provided from third week of age to sixth week of their age for all treatment groups except first and fifth treatment groups. The broiler birds in the treatment groups T1 and T5 were reared under normal temperature conditions (250C). Treatment group first (T1) was kept as control group. Antioxidant Vitamin E 250 mg per kg of feed was supplemented to the basal diet in the third treatment group. Chromium 0.1 gram per kg of feed was supplemented to the basal diet in the fourth treatment group. Chromium 0.2 gram per kg of feed was supplemented to the basal diet in the seventh treatment group. The data on individual body weight of the experimental birds and the cumulative feed consumption and feed conversion ratio on group basis were recorded at weekly intervals. Deaths were recorded daily and all dead birds were necropsied to identify ascites syndrome. There was no significant (p< 0.05) difference in the average body weight and body weight gain among various treatment groups throughout the experiment period. The cumulative feed consumption showed significant (p< 0.05) difference among various treatment groups throughout the experiment period. Highest feed consumption (p< 0.05) was observed in broiler chickens reared under cold conditions when compared with broiler birds reared under normal temperature conditions. Among the cold challenge treatment groups (T2, T3, T4, T6 and T7), there was significant (p< 0.05) improvement in feed conversion ratio (FCR) in the treatment groups T6 (early cold conditioning birds exposed to cold stress) and T7 (supplementation of chromium 0.2 g/kg of feed to birds exposed to cold stress). Among different treatment groups in general best FCR was observed in treatment group T5 (early cold conditioning group reared under normal conditions) followed by T1 (control group reared under normal conditions). At the end of the biological trial ascites linked mortalities showed significant (p< 0.05) difference among various treatment groups. There was no mortality reported in treatment groups kept under normal temperature conditions (T1 and T5). Highest ascites related mortality (23.07%) was observed in treatment group in which cold stress was provided and no measures were taken to alleviate the effect of cold stress on broiler birds (T2). The Vitamin E supplementation in the diet of broiler birds reared under cold stress (T3) showed significant (p< 0.05) reduction in ascites related mortality (10.25%). The Effects of some Herbal Essential Oils against Salmonella and Escherichia coli Isolated from Infected Broiler Flocks. Habibi H, Ghahtan N and Morammazi S.
Escherichia coli and Salmonella spp are two bacterial infectious diseases responsible for heavy economic losses in the poultry industry. The emergence of antimicrobial resistance and its potential harmful threat to human health has led to a need to find safe alternatives for the control of these bacteria. To this end, the use of herbal remedies in poultry has been suggested. In this study, we have investigated the effect of essential oils extracted from five different herbal plants against Salmonella spp and Escherichia coli that have been isolated directly from infected broiler flocks. Standard Disk-diffusion method, Minimum Inhibition Concentration and minimum bactericidal concentration were used to determine the inhibitory effect of these essential oils. Also, tetracycline was used as a control group. Among the essential oils, Carum copticum had the highest antibacterial properties. The maximum inhibition zone in diameter against Salmonella and Escherichia coli were respectively 26.7 and 22.5 mm that concern about Carum copticum essential oils. According to the results of this study, it was found that some of the essential oils have a stronger antibacterial effect than tetracycline. So, after the complementary studies, some of these herbal plants can be suggested as alternatives to antibiotics for treating infections caused by these bacteria in poultry industry.